Transcriptional modules play a key role in the organization and function of regulatory networks. Recent comparative studies have shown that various modules are conserved across a wide variety of organisms from E. coli to humans, encompassing many basic cellular functions as well as animal-specific ones. However, little is known about the molecular mechanisms and evolutionary processes that underlie such conservation. Here, we employ a novel comparative approach to explore the evolution of cis-regulatory programs of conserved transcriptional modules. Our study integrates expression data for two yeast species with sequence analysis of 11 additional fully-sequenced fungal genomes. We show that while certain conserved modules may be accompanied by strict conservation of regulatory mechanisms, the regulatory programs controlling other conserved modules are undergoing rapid evolutionary changes. In particular, we demonstrate that even the cis-regulatory programs governing tightly conserved and essential functional modules, such as ribosomal proteins and ribosome biogenesis, have underwent radical changes, while the modules themselves remained intact. We uncover the evolutionary dynamics underlying such changes, and demonstrate that transcriptional modules are primary functional entities that constrain the associated regulatory mechanisms, but that the latter can be remarkably flexible and variable, offering different mechanistic solutions to yield the same functional network organization. Our results provide insights toward the dynamics of cis regulatory evolution and may help understanding the evolovability and increased redundancy of transcriptional regulation in higher organisms. 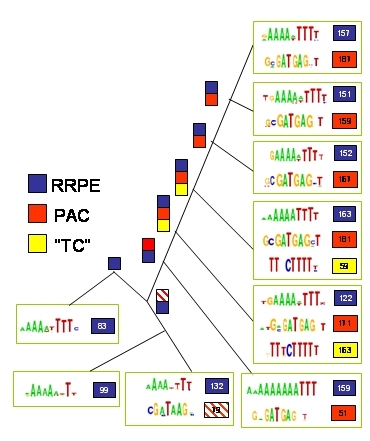 Conserved yeast transcriptional modules and the evolution of their cis-regulation.